Of course. What else would the pre-schooler pants 2.0 be called? Perfect for Sew Mama Sew's Back To School features. 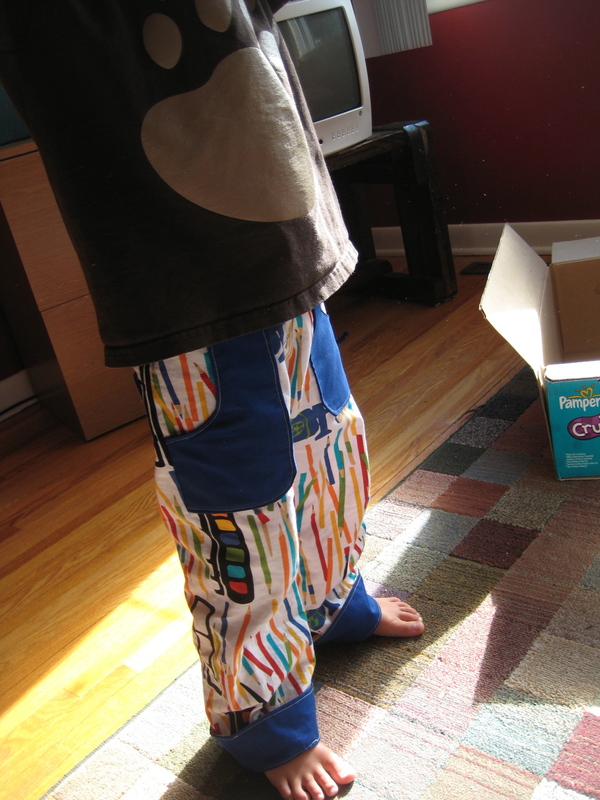 You may remember that these particular pants are terrific for the active, growing kid. They are easy to wear with an elastic waist and have plenty of pockets for all sorts of treasures. I even added two back pockets to the Kindergartner version of these pants. And don't forget that awesome cuff at the bottom that can be rolled down as your child grows. Even though your child grows like a weed, you won't have to shell out more money halfway through the year for new pants. Just roll 'em on down. Yay! You'll have to click over to Sew Mama Sew to get the pattern download and tutorial (and read an awesome introduction here). And while you're there, check out the first mix of fabric I used in the tutorial. Monkeys and other safari animals combined with stripes. Love it! The Kindergartner Pants that are pictured above on Logan are made with Michael Miller's Art School combined with a solid blue. Love this combo as well. Perfect for the first day of Kindergarten. He's even cute when he naps in them. Awww, I can't believe he's old enough to be going to Kindergarten this year. Time flies. Tawny Bee Flickr (been seriously working on Project Project Runway lately (Project Runway only on Barbies). All the photos for this fun project are on Flickr. Is there a 12 step program for that? thank you! I'm so glad the people are enjoying the pattern as much as I do. It's so nice to share something like this with the large Sew Mama Sew audience. Congrats Tawny!!! So happy for you that you got to post your tutorial on Sew Mama Sew! The pants are so cute.